Today has been one of those days. I have laryngitis thanks to a stupid cold, and the boy I had two [apparently not so] wonderful dates with appears to have disappeared off the face of the earth. I decided to turn to Hershey, as their chocolate cake recipe is my favorite ever, and I figured the brownies would be delicious as well. And delicious they are! Moist, chewy, and rich. I think this may be my new fave. Heat oven to 350°F. Grease 13 x 9 x 2-inch baking pan. Beat eggs in large bowl until foamy; gradually beat in sugar. Blend in butter and vanilla extract. Stir together flour, cocoa, baking powder and salt; add to egg mixture, blending thoroughly. Stir in white chips. Spread batter into prepared pan. Bake 25 to 30 minutes or until brownies begin to pull away from sides of pan. Cool completely in pan on wire rack. Cut into bars. I would choose brownies over a man any day! They look out of this world! I will make them this weekend they look so good! I made these last night and they came out very dense and were not sweet at all. I followed the directions exactly. Any suggestions? I would love to make these again as long as they come out right!!! I baked them for 25 minutes. Any longer they would have been burnt. Melissa, I’m sorry they didn’t work for you. Any chance you didn’t measure the sugar or cocoa powder correctly? Those could affect the sweetness. Re: the baking time, that will always vary depending on your oven. And the recipe says 25-30 minutes, so 25 was spot on. I measured everything perfectly–leveling off the dry ingredients with the dull end of a knife. I’m going to attempt to bake them again tonight and I’ll let you know!! I made these too, and the next day they were very dry. I’ve never had that happen to my baked goods before. I know it’s not your fault. 🙂 How did you store these (and/or all your baked goods)? In Tupperware? Plastic wrap over the pan? Thanks for posting all the baked goodness! That is so weird! Mine were not dry the next day at all. Hmm. I store them in a large Rubbermaid container–nothing special. I’m stumped! Did you beat the eggs until foamy? I’m wondering if that’s the problem? Wow. A great, cake-y brownie. Couldn’t be easier to whip up too. If you’re not in the mood for the fudgy, gooey, and frankly, messy brownies that all seem to rave about – then this is the one for you. 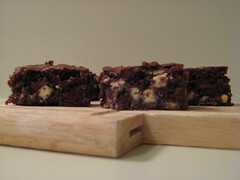 The white chips give the sweetness, but also make it a pretty brownie – not just a brown blob of chocolate. Tks for sharing – even if it was 3 years ago!